On Sunday December 9, 2018 our community has a great opportunity to come together with (2) events where you can make it to both! First, Station #43, West Windsor Volunteer Fire Company #1 (WWVFC#1), will be hosting Breakfast with Santa from 8:30 am-1 pm. There you'll have a chance to not only get a nice breakfast but photos with Santa himself. Since "Operation: Barkdrop" is really down on donations, K9s Mackey & Cherno decided to step up and take action! From 11 am- 1 pm, you will get the rare opportunity to take photos with our K9, who adore humans but can't take photos with other dogs. 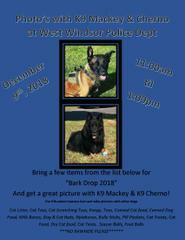 K9s Mackey & Cherno are asking for you to bring in some donations for their homeless friends (**See attached Flier**). Come to the lobby at WWPD and we will gladly help you. You can go to Breakfast before or after your visit with our K9s!